Nov.15 2016 - Nov.15 2017. Joint Ph.D. Candidate, Computational Mechanics. Faculty of Science, Technology and Communication, University of Luxembourg, Luxembourg. Advisor: Prof. Prof. Stephane Pierre Alain Bordas and Prof. Gengdong Cheng. Sept. 2015 - Present. Ph.D. Candidate, Computational Mechanics. Department of Engineering Mechanics, Dalian University of Technology, China. Advisor: Prof. Ping Hu and Prof. Gengdong Cheng. Sept. 2013 - June 2015. M.E., Engineering Mechanics. 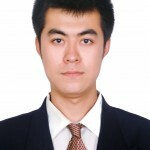 Department of Engineering Mechanics, Dalian University of Technology, China Advisor: Prof. Ping Hu. Sept. 2009 - June 2013. B.S., Theoretical and Applied Mechanics. Institute of Mathematics, Jilin University, China.